This is a problem in assistive technology, where we usually have maybe one and one half competitors. That is, Microsoft delivers, and open source tries to catch up. Those are the only two choices. Thus Microsoft is able to use its technology lead to dictate to those needing assistive technologies, then use their needs to dictate to the rest of the market. Thus it doesn't matter that there are multiple vendors within the Microsoft space, in, say, screen readers. There aren't enough to create a competitive market, because they are all working on the same platform. If open source could match Microsoft, feature-for-feature, and match Microsoft's delivery schedule, date-for-date, and if open source were also as able to innovate on behalf of its customers as Microsoft has been, then we would have a competitive market, even if Apple never entered it. Of course, having two vital competitors does not guarantee true competition. The cellular industry, for instance, has four national competitors in the U.S. Yet it has no real competition. There is no place a customer can go who wants store personnel who know something, or who wants network neutrality, or who demands to be treated as a person. None. I've been with Cingular, I've been with Sprint, I have many friends who've been with T-Mobile and Verizon, and they all sing the same tune. All the terms and conditions are identical. The pricing is virtually identical. The customer service is identically bad. Thus Europe and Asia are walking off with the market, because they have competition, and thus they have an incentive to not only innovate, but to treat customers right. 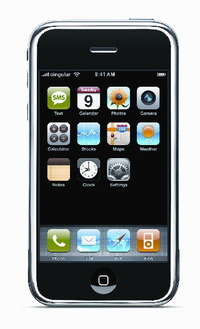 The history of the Apple iPhone, left, is illustrative. The product could have and should have come out a year earlier, from Motorola. Its delay was based on the carriers' absolute refusal to carry a product that would give someone else (Apple) control over the environment and what people could do. When the phone finally did emerge, a few months ago, it had an AT&T brand, and AT&T would control it. If Apple can't force competition on this market, it's obvious something is terribly wrong. Can we get a truly competitive environment in the assistive technology space? What must be done in order for that to happen? That's the key question for this year, next year, and the year after that. Is there anyone out there with an answer? The trick is to get the Collective Mind of the internet to think more about those who need assistance. This article will discuss what we have to choose for the baby’s first Christmas. You could be one of those people who are thinking about wanting to know about where to buy cheap jerseys. Some were booked solid, and others had owners who didn't want to anger the Knicks by opening their doors to a rival team. Since the team was scrambling for a venue with opening day approaching, it finally settled on the Armory in Teaneck, New Jersey, and changed its team name to the New Jersey Americans, though its franchise name remained the New York Americans.